Self-employment tax is based on the income of a business owner and it's collected to cover deposits made for Social Security and Medicare. 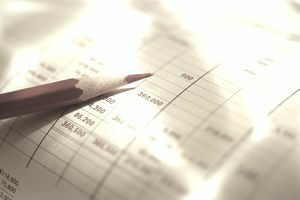 Schedule SE calculates the amount of self-employment tax owed by a business owner based on the profit or loss of his business during the tax year. It includes both a short form and a long form. The following instructions are for relatively simple self-employment situations. You might benefit from consulting a tax professional if you find your situation is more complex. Everyone pays Social Security and Medicare taxes, but how much you pay and how you calculate it differs depending on whether you're self-employed or you work for someone else. Most people work for someone else and have their Social Security and Medicare taxes collected and withheld from their earnings by their employer. They pay half and their employers match their contributions, paying the other half. A self-employed business owner doesn't get a paycheck from someone else that this money can be withheld from, and he doesn't have an employer to match the half he pays personally. The self-employed individual has to pay the full amount himself...sort of. Who Is Considered Self-Employed for Tax Purposes? Self-employed business owners include sole proprietors, single-member limited liability companies (LLCs), and S corporation owners. Also included are partners who must pay self-employment tax on their share of partnership income. Members in multiple-member LLCs are considered partners for federal tax purposes. The IRS includes helpful directions on each line of Schedule SE to guide you step by step. After you get through completing the form, don't forget to include the schedule when you file your tax return. You must first determine the net income from your business — or, if you own several businesses, from all of them added together. You'll calculate your net profit on Schedule C. Thie represents your overall revenues less your qualifying business expenses. You can move on to Schedule SE for self-employment taxes once you've determined this number. You must then calculate the amount of the deduction for self-employment tax. Beginning with 2018 taxes, this deduction must be entered on Schedule 1, Line 27 of your Form 1040. You get a tax deduction for half of your self-employment tax, which eases the sting considerably from having to pay both the employer's and the employee's half. You'll enter this deduction on page one of your tax return so that it reduces your adjusted gross income — your net taxable income before you take other deductions. The amount of self-employment tax is calculated next. The total net profit from all your businesses is considered, but only the first $128,700 is taxable for Social Security purposes as of 2018. The ceiling was $127,000 for the 2017 tax year. If you had no income all year other than your self-employed income and you meet certain other qualifications, you might be able to complete the short form, which is Section A. Otherwise, you must complete the long form, Section B. You'll need a copy of Schedule SE, which can be downloaded from the IRS website. You can complete the form online, save it, and print it out. You'll also need a completed Schedule C for each of your businesses, as well as copies of any W-2 forms you might have for the year if you also worked for someone else and you had Social Security and Medicare taxes withheld from your paychecks. Your W-2 forms will show how much Social Security and Medicare taxes were deducted from your pay. You'll find this information in boxes 4 and 6. You'll also need your individual income tax return form, IRS Form 1040. You can start with line 2 if you have none of the income that's described in lines 1(a) or 1(b). Enter the net income from your Schedule C. If you have more than one Schedule C, total the net incomes from all of them and enter that number. Add that to line 1 if you entered anything there and put the result on line 3. Multiply line 3 by 92.35 percent and enter the result on line 4. If the result is less than $400, you don't owe self-employment tax. Calculate your self-employment tax on line 5. If it's $127,200 or less, multiply line 4 by 15.3 percent. If it's more than $127,200, multiply line 4 by 2.9 percent then add $15,772.80 to the result. You must now include the self-employment tax calculation on your Form 1040. Enter the result from line 5 on Form 1040, Line 57. Multiply line 5 by 50 percent. Beginning with 2018 taxes, this amount is then entered on Line 13 of Schedule SE and on line 57 of Schedule 4 your 1040. This section is the self-employment tax calculation for individuals who have income in addition to self-employment income. The calculation combines FICA taxes — Social Security and Medicare tax — you already paid on your other income and those you owe on your self-employment income to determine the self-employment tax owed. For line 1, enter your net farm income 1(a) and/or Social Security income 1(b) if you have any and total them. Then, on line 2, enter your net income from Schedule C. Total lines 1 and 2 on line 3. For line 4(a), multiply line 3 by 92.35 percent. If the result is less than $400, you don't owe self-employment tax. Include the FICA tax that you've already paid on wages to determine if any self-employment tax is owed. Subtract line 8(d) from line 7, the Social Security maximum amount, and enter this on line 9. If it's zero or less than zero, just enter that and jump to line 11. If it's more than zero, multiply the smaller of line 6 or line 9 by 12.4 percent on line 10. Multiply Line 6 by 2.9 percent on line 11. Now you can Include your self-employment tax calculation on Form 1040. Add lines 10 and 11 and enter the result on Line 12 and on Form 1040, line 57. Line 13 is the deduction for one-half of your self-employment tax. Multiply line 12 by 50 percent and enter the result on Schedule 1, Line 27 of your Form 1040. First, Schedule 1, Line 27, which reduces your adjusted gross income by half of the self-employment tax amount. Then, go to Schedule 4, Line 57 to include the total self-employment tax owed in addition to personal income taxes. The amount on Line 57 is added to your personal income tax calculation along with some other taxes to show your total federal tax liability for the year.